The Basenji is an energetic and playful dog. Its most unique characteristic is its bark, or lack thereof. The Basenji makes a great pet as long as it is handled frequently starting when it is a puppy. Basenjis are mostly silent, and the noises they do make consist of yodeling and howling sounds. 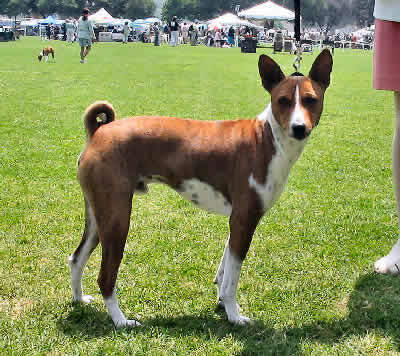 When selecting a Basenji, it is wise to check its bloodlines for Fanconi syndrome, Hemolytic Anemia and eye disorders. Other ailments to look out for include hip dysplasia and malabsorption. Breed Type The Basenji is a hound breed. They originated as hunting dogs, and are still used for hunting in Africa. Background The Basenji originated in Africa, where it was a favorite of Egyptian pharaohs. The breed wasn't successfully brought to England until the 1930s, and was subsequently introduced to the United States. Most Western Basenjis are descended from the original imports, but more were imported from Africa in the 1980s to increase the gene pool. Description The Basenji has a smooth coat, and may be red, black, black and tan, or brindle, all of which are accompanied by white. Most have white on their feet, chest, and tip of tail, and some have white on their face, legs, or around their necks. They have straight ears, small eyes and curled tails. The male Basenji is 16-17 inches tall and weighs 22-26 pounds. Females are 15-16 inches tall and weigh 20-25 pounds. Care and Feeding The Basenji thrives on a diet of beef, horse meat, and poultry with brown rice and wheat as carbohydrates. This breed needs very little grooming. The Basenji washes itself like a cat and has no odor. They only need to be bathed if they get very dirty. Basenjis shed little or no hair, so they do not make a lot of extra vacuuming necessary. They do, however, tend to be messy, especially if left alone. Keeping lots of dog toys and keeping personal belongings out of reach will help avoid destructiveness. Housing Your Dog Basenjis can be kept indoors or out, but if outdoors they need adequate shelter. They do not like wet weather. The breed is very active indoors, so it should ideally have plenty of space. They need at least a small yard to play in. Since the breed can be destructive if bored, sturdy food and water dishes are recommended. Social Behaviors Basenjis can develop strong bonds with people if handled regularly starting at a young age. They are not recommended for small children. They love to play with other Basenjis, but they may not get along well with other pets. Handling and Training The Basenji is very agile, making it a good candidate for agility training. The breed is also easy to housebreak. They are strong-willed, so training will require firmness and consistency. Activities The Basenji's high energy level makes lots of exercise a necessity. They need long walks each day, as well as ample play time. Breeding/Reproduction When considering a mate for your Basenji, checking bloodlines is very important. Although less common today than in years past, there are several hereditary disorders that they may carry. These include Fanconi syndrome and Hemolytic Anemia. Female Basenjis only come in heat once per year. Common Health Problems One of the most serious ailments common to Basenjis is Fanconi syndrome, a urologic disorder that usually develops symptoms between 4 and 8 years of age. It is important to begin treatment early, and it is recommended to test the dog's urine for glucose once each month beginning at 3 years of age for early detection. Another problem Basenjis sometimes face is malabsoprtion, an intestinal disease. Dogs with malabsoprtion require a special diet to reduce symptoms. Availability Basenjis are not especially common outside of Africa, but they can be found domestically online if there is not a breeder nearby. Prices generally range from $500 to $800. "Choosing a Basenji", PetPlace.com, Copyright 1999-2008 Intelligent Content Corp. Watched a good family movie last night 'Goodbye My Lady' with Walter Brennen and Brandon Dewild. It's about a boy and his rescued dog - a Basenji, made about 1956 - Black and White. After seeing that very movie we saw a young boy bring a sign to the edge of the road 'Basenji pup for sale' and we bought it. Long story short we ended up getting another, a female, and showed them to their championships and opened a kennel. Had 35 at one time. That was 40 years ago. Hadn't thought of 'Goodbye my lady' for a long time. I'm smiling now. As you can see, I wrote the story about my precious Basenji - Bakagi, whom I also call 'little one'. We absolutely love 'Farewell my Lady'. She looks just like our little girl. It is amazing the world has not discovered these amazing little creatures. I consider them to be one of God's best kept secrets! Ours attracts attention wherever she goes. People are stunned when I tell them she is the oldest breed in the world! Imagine being around during the time of the Pharaohs and being able to live with one of these beautiful , elegant little dogs. I consider the Basenji breed to mean: Beautiful Amazing Stunning Elegant Natural Joyful Intelligent (the 1st letter of each of these words put together spells BASENJI). Can you tell I am a forever fan? Would LOVE to have a puppy! I know this is quite some time since you wrote your comment, but thank you, Larry. We rescued our girl from Colorado Basenji Rescue. We own 'Goodbye my Lady' and coincidentally live in Colorado where Brandon de Wilde was killed crossing a street in Denver (where I am from) in 1972. He was 30 years old. The Basenji - My Lady of the Congo (her double in the film was often her little brother My Lord of the Congo and Flageolet of the Congo), who starred in the film with Brandon. My Lady curiously bonded with Brandon which later caused him to adopt her. When I say 'curious', it is because I live with a rescued female Basenji and the breed is known to only truly bond with ONE (1) individual. My Lady of the Congo, a six-month-old Basenji puppy was owned by Miss Veronica Tudor-Williams of Molesey, England which normally means she would have bonded with her owner. Nevertheless, it is wonderful Brandon was able to take her with him. We rescued a four-year-old female Basenji from Colorado Basenji Rescue (WONDERFUL organization - only Basenji rescue within a five-state region) five years ago. At the time, her name was 'Pretty Girl'. We have a very good freind (the Priest who married us) from the Congo from where Basenjis originated. We asked him to name her in his Congolese Dialect. Her name is Muana wa Bakagi Mulenga. She answers to 'Bakagi'. She is absolutely one of the most amazing 'creatures' with whom I have ever had the pleasure of sharing my life. I would never have any other 'dog' other than a Basenji. They are no less than amazing. We go to a Rescue Reunion every year where there are sometimes 50+ dogs and NO barking! There are yodeling contests, dancing contests, etc. but spending those few hours with that many of God's special creatures is an UNBELIEVABLE treat! Thank you Peggy for all that you have done and continue to do in rescuing these amazingly beautiful creatures! Basenjirescue.org has more information and support if needed. They also have Basenji's that need rescue on their sight. Do you know where Sailor is now? I think I might have found him. I'm up north in Marysville, but when I found this little dog plainyg in the street I thought, he looks like a chihuahua basenji mix so I googled that mix to see images and sailor looks EXACTLY like him. He's not neutered, he's got all the same markings and a similar personality to what you described. If you know who has him now, maybe drop them a line to let them know he's safe and email me so I can get in touch with them. We also have two dogs already, so we can't keep him.